Every year, the National Abortion Federation -- sort of an abortion provider's guild, if you will -- gathers for an annual meeting in which they share with one another the trials and triumphs of their business. A recently released video looks at a topic they've brought up before: Nobody understands what it's like to be the person actually doing the abortion. Those who actually do the abortions feel marginalized and shut out even by their own political allies. "Our stories don't really have a place in a lot of pro choice discourse and rhetoric, right?," laments Dr. Lisa Harris, Medical Director of Planned Parenthood of Michigan, during a panel discussion. She delves into the details of what her audience clearly appreciates. "The heads that get stuck that we can't get out. The hemorrhages that we manage. You know, those are all parts of our experiences. But there's no real good place for us to share those." Indeed. Most of us, when we go home to our families and friends, can complain about the difficult day we've had at work. A cashier can share the story of a rude customer. A truck driver can lament about the idiot in a Camaro who cut him off. An attorney can grouse about the troublesome ruling a judge made. Even people with jobs that tend to be yucky can find time to vent with family and friends. A trash collector might not discuss the maggots over dinner, but he could bring it up with friends on a fishing trip. A surgeon wouldn't bring up a huge tumor at a cocktail party, but she could bring it up over yard work, perhaps. But under what circumstances could one discuss fishing around inside a woman's body with forceps, trying desperately to pull out a human head? 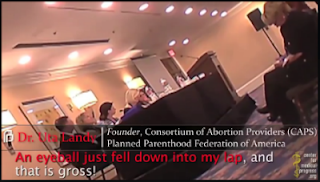 Dr. Uta Landy, founder of the Consortium of Abortion Providers, relates another experience common to them all, judging from the chuckle it elicits: "An eyeball just fell down into my lap, that that is gross!" Nobody's going to want to hear at all. Not even people who are adamantly pro choice. Perhaps especially not people who are adamantly pro choice. Loose eyeballs and stuck heads aren't the sort of things one wants to be thinking about when asserting abortion as a mere exercise in bodily rights. Imagine if you will, a pro choice rally regarding late-term abortion laws. What's being discussed? Women's circumstances. A teenager who put off admitting that she was pregnant. A mom learning that her unborn child has a serious illness or disabililty. A family facing financial hardship. Imagine that Dr. Ann Schutt-Aine, Director of Abortion Services for Planned Parenthood Gulf Coast, puts her two cents in. It's tricky to avoid breaking the law against doing "partial birth abortions," defined in the law as pulling the living fetus out feet first past the umbilicus (umbilical cord), and then killing the partially-birn fetus. 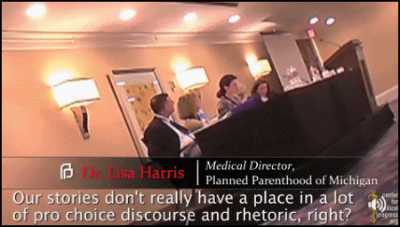 She wants to explain how she manages to avoid breaing the law when a live fetus starts to come out whole. "If I'm doing a procedure, and I'm seeing that .... it's about to come to umbilicis, then I might ask for a second set of forceps, hold the body at the cervix, and pull off a leg, or two, so it's not PBA." Her fellow activists aren't exactly going to gather around her and express their sympathy for how hard it is to stop in the middle of delivering a live baby in order to yank off a limb or two. 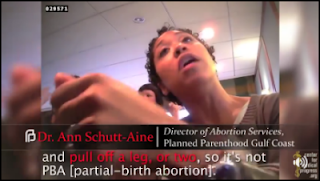 Talking about the real flesh-and-blood fetus being dismembered, and the real flesh-and-blood mother hemorrhaging on the abortion table, tends to turn people off of the whole idea of abortion. 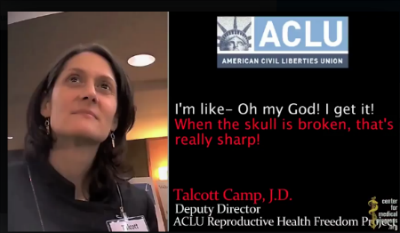 Talcott Camp, Deputy Director of the ACLU Reproductive Health Freedom Project evidenly found the NAF event eye-opening but not off-putting. "I'm like -- Oh my God! I get it! When the skull is broken, that's really sharp! I get it! I understand why people are talking about getting that skull out, that calvarium." And at some level, Dr. Lisa Harris hopes that there are lots of folks out there like Ms. Camp, who can hear the gory details and still retain an enthusiasm for the abortion-rights cause. 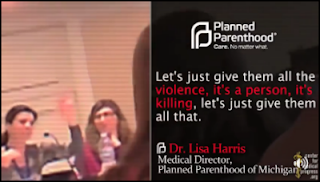 "Given that we actually see the fetus the same way," Dr. Harris says, "and given that we might actually both agree that there's violence in here, ask me why I come to work every day. Let's just give them all the violence, it's a person, it's killing. Let's just give them all that." She speaks with the confidence that comes from believing that the violence is justified. No doubt her fellows at the NAF meeting agree with her that the violence of abortion is justified. If they weren't able to convince themselves of that, very few of them would be able to stomach doing a second abortion after looking at the mangled human remains produced by the first. I'd love to see the discourse move in that direction. The entire prolife movement would love to see the discourse move in that direction. Let's by all means look squarly at the violencd that is abortion and ask if it's justified. But there are two groups of people who will never get onto that bandwagon: Those who need to maintain public support for abortion-on-demand, and those who need to keep their businesses afloat by convincing as many women as possible that abortion doesn't involve the destruction of a human being. NOTE: YouTube keeps yanking the video, so please let me know if I need to go grab another link. Little is known about Sharon Margrave, but on May 21, 1970, she died following a safe and legal abortion in Los Angeles County, California. She was 25 years old, a native of Oregon. 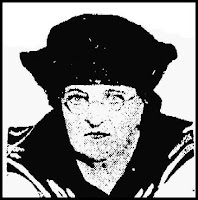 On May 21, 1939, 37-year-old widow Hilja Johnson of Butte, Montana, died at Butte's Murray Hospital from septic complications of an incomplete abortion. Since her death certificate says, "Infection from gas producing bacteria," she most likely died from a Clostridium perfringens infection, most commonly known as gas gangrene. A surgical nurse, Gertrude Pitkanen, admitted at the coroner's inquest that Hilja had come to her office, and that she had later visited Hilka at her home and advised her to go to a hospital. Pitkanen was charged with murder in Hilja's death. She fled, but was located about a year later, living near Columbia Gardens. She was brought to court in a wheelchair, pleaded innocent, and was jailed in lieu of $5,000 bond. The charges were dropped in 1940, for reasons not reported.< Pitkanen had earlier been charged with the abortion deaths of Violet Morse (August, 1929) and Margie Fraser (October, 1936). The fact that Pitkanen had married a former Butte police detective might explain the lack of prosecution in spite of the multiple deaths. According to her husband, Baptist, 26-year-old Pittsburgh homemaker Mary Jane Douds had been in ill health for four years. When he'd come home from work on the morning of Monday, May 18, 1900, he found her sick in bed. He wanted to call a doctor, but “she would not have it.” Baptist figured that his wife must be menstruating, since she always had difficult periods. When he came home on Saturday, he found Mary Jane in even worse condition. He sent for Dr. Staub, who treated her four or five times before recommending that she go to the hospital on Sunday. Mary Jane refused, asking for her old doctor, Dr. Heurits of Turtle Creek, who came to the house at about noon. Heurits examined Mary Jane, and said “there was no danger for her to keep quiet and she would be all right in a few days.” He prescribed medication for Mary Jane, but she couldn't keep it down. Baptist sent for another doctor, J.J. Green, who arrived at about 8:30 on the evening of May 20, then sent for his assistant, who stayed to provide care to Mary Jane under Green's supervision until about 3 a.m. She got weaker and finally lost consciousness a few minutes before her death at around 9:00 a.m. On May 21. Green diagnosed her cause of death as septic peritonitis from an abortion performed by an unknown perpetrator. Dr. Claude C. Long ran a rather fishy medical practice in San Francisco. He, his wife Isabel, and a relative named Ann Fisher, were charged with the May 20, 1937 murder of 26-year-old Genevieve Arganbright. Genevieve was, according to her husband, Perry, about 2 1/2 months pregnant at the time of her death. She had been in good health, athletic, and in the habit of taking long hikes, dancing, swimming, and playing tennis. On the evening of Genevieve told her husband she going for her abortion, which she had scheduled by phone the previous day. She brought with her $50 that she had borrowed to pay for the abortion. That was the last time Mr. Arganbright saw his wife. Nobody at Dr. Long's practice called to tell him that his wife had died on the operating table. Dr. Long did, however, have Mrs. Fisher make a phone call to a Dr. Goldsand, who verified that Genevieve was dead and refused Long's request that he sign a death certificate. The next call made from Long's office was to an undertaker's office. When two employees arrived to collect Genevieve's body at about 2:30 the morning of the 21st, Dr. Long wasn't present. Mrs. Long and Mrs. Fisher said that Dr. Goldsand had been the attending physician and that he would sign the death certificate in the morning. The men took Genevieve's body to the mortuary, where the embalming was done in the morning. But when no relatives called to finalize arrangements, and nobody produced a death certificate, the undertaker notified the coroner. While things were getting squirrely at the mortuary, Dr. and Mrs. Long were making tracks to a hotel. While all this was going on, nobody had even tried to contact Genevieve's husband. It wasn't until later that day, when the police arrived, that Mr. Arganbright learned that his wife was dead. Dr. and Mrs. Long were arrested at the Cecil Hotel on May 22. The prosecution argued that the abortion had not been medically indicated by Genevieve's heart condition, and that even if it had been, Long's lack of due diligence had caused her death anyway. If the abortion had been elective, and thus illegal, Long was guilty of murder in Genevieve's death. If the abortion had really been to try to prevent Genevieve's death from pregnancy stress on her heart, but had been negligently performed, Long was guilty of manslaughter. And if the abortion had been medically indicated and properly performed -- if Genevieve had died from her pre-existing heart condition -- then Long was not guilty of any crime. Long did not deny that he treated Genevieve on May 20. He said that she had not come specifically for an abortion, but was certain that she was pregnant, and that she was constantly tired, with chest pain, palpitations, and shortness of breath, all indications of heart problems. Long said that he then informed Genevieve that her heart was in very bad shape and that he recommended an immediate therapeutic abortion to prevent her death. Expert testimony agreed that Genevieve did indeed have mitral stenosis, but there was no agreement on whether or not it warranted an abortion. The surgeon who performed the autopsy, and a pathologist from the coroner's office, both testified that Genevieve's heart was not at all enlarged. Her mitral stenosis seemed stable, and their expert testimony was that Genevieve would have likely tolerated pregnancy and delivery quite well. Dr. Carr, the pathologist, testified that a patient sick enough to require an abortion would also have been too sick to simply perform one on the spot; a conscientious physician would have sought a consultation with a cardiologist, and would have hospitalized the patient for some time before the abortion in order to ensure that she was strong enough to survive the surgery. He also noted that the agony of having one's cervix ripped off would be enough in itself to cause shock in a patient with a weak heart. All of these factors were indicative of lack of due diligence on Long's part in performing the abortion, regardless of his reasons for performing it. At the very least, if he really was performing the abortion due to concerns about Genevieve's heart problems, he was guilty of manslaughter for performing an outpatient surgery and ripping his patient's internal organs so badly. Long was granted his request for a new trial, and his conviction overturned, on the grounds that the judge had improperly instructed the jury, placing the onus on the defense to prove the abortion had been medically indicated, rather than on the prosecution to prove that it had not been. In May of 1934, 22-year-old Mary Schwartz asked Marie Hansen, a coworker at the Illinois Meat Company in Chicago, to help her arrange an abortion. Marie took Mary to Dr. Justin L. Mitchell's office south of Chicago's meatpacking district. Marie had undergone an abortion at Mitchell's hands three years earlier, and, telling him that her friend “wants to get fixed up,” she negotiated a discount from the usual price of $50 to $30. Marie co-signed on a $25 loan, and lent Mary $5 “in dimes” from her own money. The next morning, the two women again went to Mitchell's office. Marie waited outside during the abortion, then took Mary home with her to recover. That evening, Mary took ill, so Marie called Mitchell and told him that Mary “was bad sick.” Mitchell told Marie to give Mary castor oil, and place warm towels on her abdomen to help with the pain. This did not alleviate Mary's pain, so on Marie took her back to Mitchell's office on Thursday evening and Friday morning. At 4:00 Saturday morning, Marie was very concerned and called Mary's lover, Joe Henja, who was a foreman at the meat plant. Joe complied with Marie's request that he come right away and get Mary. He called his own doctor then rushed Mary to a hospital, where Mary died on May 20, 1934. Mittchell was later implicated in the abortion deaths of Alice Haggin and Mary Nowalowski in 1936. On May 20, 1870, Matilda Henningsen died at No. 182 East Seventh Street in Brooklyn. Matilda's sister, Henrietta Henningsen, testified that she recognized clothes and other items belonging to her sister. Matilda had been sick about two months earlier, and had been treated by Dr. Herzog and Dr. Kennerer. Shortly after having taken ill, Matilda told Henrietta that she'd gotten an invitation to go to Williamsburgh, and that was the last Henrietta had seen of her sister. Dr. Joseph B. Chshman testified as to the post-mortem examination he had performed. He said he found all the evidence of uterine infection and resulting peritonitis, resulting from an abortion. Mr. A. A. Wolff, from Denmark, purported to be a physician, but is not identified as such in the source document. Six fetuses, along with various instruments, were found in his office. The jury determined that Wolff had performed the fatal abortion. Wolff was also implicated in the abortion death of Henrietta Ullman less than a month after Matilda's death. Nearly all of today's deaths are connected with facilities or practitioners with multiple abortion deaths to their discredit. Chivon Williams, just days short of her 17th birthday, died on May 19, 1995 after an abortion performed by National Abortion Federation member Alberto Hodari in Detroit. According to a lawsuit, a suction abortion was performed on Chivon at about 11:30 a.m. She was discharged from the facility at about 1:10 p.m. even though she reported stomach and chest pains. A short time after returning home, she was found unresponsive, and pronounced dead at 5:17 p.m. Fieger Times, a newsletter put out by the law firm representing Tamiia's family, states that Chivon had been in the first trimester of pregnancy. Hodari was also implicated in the abortion deaths of 15-year-old Tamiia Russell and of Regina Johnson. Susan Levy was 30 years old when she underwent a safe and legal abortion at the Family Planning Associates in Mission Hills, California on April 9, 1992. 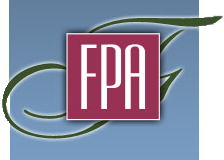 FPA is a member of the National Abortion Federation. Susan, originally from Florida, was homeless and was living in a car owned by a friend. On May 19, 1992, she was found dead in that car. The cause of death was determined to be from an infection that developed from fetal tissue that was not removed during her abortion. The autopsy report for 22-year-old Joan Camp attributed her death to "complications apparently as a result of a recent termination of pregnancy." Joan had been found unconscious in the morning on May 18, 1985. She was rushed to Memorial Hospital in San Leandro, California, where doctors tried to save her life. Their efforts were futile. Joan died the next morning, May 19, 1985, from clots in her lungs. The CDC classified Joan's death as "unknown" abortion, because they could not find out where the abortion was done. The CDC does not count an abortion death as a legal abortion death unless they can verify that the person who performed the abortion was a licensed physician, or another legally qualified medical professional in states that allow non-physician abortions. Irene Kirschner, age 24, died on May 19, 1932 after an abortion believed to have been perpetrated by Dr. Lou E. Davis. When police went to arrest Davis for Irene's death, they found another abortion-injured woman at her house but no sign of Davis. Davis was also implicated in five other Chicago abortion deaths: Anna Adler in 1913, Mary Whitney in 1924, Anna Borndal and Esther V. Wahlstrom in 1928, and Gertrude Gaesswitz in 1934. On May 19, 1858, 28-year-old Amelia Weber died at the home of 58-year-old Dr. Charles Cobel in Brooklyn and was buried in Greenwood Cemetery. The undertaker testified that Cobel had engaged him to perform the funeral, and that he had collected Amelia's body from Cobel's garret. Cobel attributed Amelia's death to paralysis. "[F]rom the privacy of the burial and other mysterious circumstances surrounding the case, the body, six days after interment, was ordered by the Coroner to be exhumed for medical examination." The witnesses at the inquest included Amelia's husband, who kept a hotel in Schobaria County, New York. Testimony indicated that Amelia had left her home and three children in Warrenville a few days before her death, supposedly to visit friends in Brooklyn and to do some shopping. Instead, Amelia went directly to Cobel's house, arriving on May 8. "Dr. Cobel received an application from Mrs. Weber, who had left home for that purpose with her husband's consent, on the 8th instant, to produce an abortion upon her person, he did so, and violent inflammation supervened, which baffled his skill. He then called Dr. Kertachmann, pretending that the lungs were the seat of disease, but it was to no purpose." The autopsy revealed noting at all wrong with Amelia other than an abdominal infection caused by the abortion and bringing about her death. Cobel was indicted for manslaughter in Amelia's death on November 30, 1861. On January 23, 1862 he was tried and found not guilty of manslaughter in the second degree, but guilty of the misdemeanor charge of using instruments on a pregnant woman with intent to cause abortion. Cobel successfully appealed the misdemeanor conviction on the grounds that he couldn't simultaneously be guilty of performing the abortion yet not guilty of causing Amelia's death by performing the abortion. 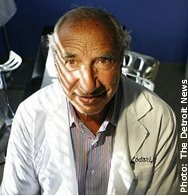 Cobel, a known abortionist, was also implicated in the deaths of Antoinette Fennor, Catharine DeBreuxal, and Emma Wolfer. Was Anna Albers Really Responsible? On May 16, 1916, 25-year-old Lucile Bersworth died in Chicago's German-American hospital after telling authorities that Dr. Anna Albers had perpetrated an abortion on her. She also mentioned a man named Fred Krause, so he might have been her baby's father. Though Albers was held by the coroner and indicted by a Grand Jury, the case never went to trial. She was rather a respectable physician, at least as of 1912, so she seems an unlikely abortionist. "Roxanne" was 17 years old when she decided to take advantage of New York's new abortion law, and traveled there from Michigan to have a first-trimester abortion in a doctor's office. The doctor gave her sedatives and local anesthesia to begin the abortion on May 13, 1972. But before the abortion could be started, Roxanne started to have convulsions and went into cardiac arrest. Roxanne was taken to an area hospital, but she was declared dead on arrival. An investigation into the case revealed that the doctor had exceeded the recommended dose of the local anesthesetic. Fifteen-year-old Sara Neibel went to Midtown Hospital in Atlanta for a safe and legal abortion at 17 weeks. She was given a clean bill of health and sent home. The next day, she reported a severe headache, sore neck, neck stiffness, and trouble seeing. Her parents began the drive to take her to the hospital. On the way there, Sara began screaming and behaving strangely. When they got to the hospital, she refused to get out of the car. She was disoriented and stuporous upon admission. Sara went into respiratory arrest, and was admitted to the ICU. She was pronounced dead May 11, 1994. The cause of death was determined to be Group B Streptococci Meningitis caused by infected amniotic fluid in her bloodstream. The autopsy performed on Sara found dead tissue and a fetal bone fragment in her infected uterus. "Melissa" is one of the women Life Dynamics identifies on their "Blackmun Wall" as having been killed by a safe and legal abortion. Melissa was 27 years old and five months pregnant when she checked into Lutheran Medical Center of Brooklyn on May 1, 1992. For some reason, her doctor chose the dangerous and antiquated saline abortion procedure. She died of complications on May 11. A lawsuit filed by the father of Barbara Dillon, a 22-year-old college student, alleged that Barbara underwent a safe and legal abortion performed by Dr. Mark Silver at Long Island Gynecological Group April 18, 1981. Barbara's father said that the pathology report identified placental tissue, but no fetal parts. This meant that something had gone wrong, and that Barbara needed medical care, but nobody contacted her to tell her this. Barbara suffered pain and bleeding from May 5. She went to the emergency room and was treated with antibiotics and advised to see her family doctor. She was in severe pain later that day, so her roommates called the emergency room again. They were told to give the antibiotics more time. Barbara's pain did not abate. On May 10, her roommates got a neighbor to take Barbara to the university health center. Barbara was unconscious upon arrival, with no respiration, blood pressure, or pulse, and was rushed to the emergency room. There were delays finding a doctor from the clinic who would aid the emergency room physician in addressing Barbara's symptoms. She went into irreversible shock and died on May 11. It turned out that Barbara had an ectopic pregnancy which the clinic had failed to detect. Barbara's father also sued Silver over his daughter's death. Even though, in theory, women who choose abortion should be less likely to die of ectopic pregnancy complications, experiences shows that they're actually more likely to die, due to sloppy practices by abortion practitioners. On May 11, 1884, a young woman who had given her name as Alice Brown died at the Chicago residence of Mrs. R. A. Hough. She was identified as 20-year-old Lottie Hudson of Austin, Illinois. She had gone to Chicago to live with a man identified as C. O. Owen, "a printer who already had a wife and family." He was boarding with Lottie's mother, Mrs. Hudson, who had visited Lottie twice at Mrs. Hough's home during her illness. It was determined that Lottie had died from blood poisoning due to an abortion, believed to be perpetrated by a doctor whose name neither Lottie nor Mrs. Hough either could or would divulge. On the day of the funeral, Mrs. Hough went to Mrs. Hudson's house and "was decidedly uneasy during the forenoon." At 11 a.m., Hough asked Mrs. Hudson to leave with her because the police would soon come to arrest them since they'd not called in a doctor to attend to Lottie as she was dying. At 5:00 p.m. on Thursday, May 9, 1901, Jessie Matteson, a 22-year-old homemaker, died from an illegal abortion in Chicago. She had been sick for about a week. Jessie's husband, Guy, was arrested, as was Dr. J.B. Butts, who was held by Coroner's Inquest on May 16. Jessie and Guy had only been married since the previous Thanksgiving. Guy was described in the Belvedere Daily Republican as "connected with a Chicago publishing house." Jessie was a 1899 graduate of South Belvidere High School. She was a teacher in the Witbeck and Hicks schools prior to her marriage. Butts held that while he did perform an abortion on Jessie, he had only done so because she had health problems that would have made childbirth dangerous. During their trial, the judge dismissed the charges against both Jessie's husband and Dr. Butts on the grounds that there was insufficient evidence for a conviction. On May 2, 2009, 18-year-old Antonesha Ross went to Women's Aid Clinic of Lincolnwood, Illinois. She had an ultrasound performed that showed that she was 13 weeks pregnant. She made a down payment for an abortion to be performed on May 8, at which time she would pay the additional $390 that was due. She returned as scheduled. Dr. Josephine Kamper performed the abortion, while CRNA Lawrence Hill administered anesthesia. During the abortion, Antonesha's blood oxygen saturation fell to between 80% and 90%, and she began to cough up blood through her mouth and nose. An employee gave her a bag to breathe into. Needless to say, this wasn't any help, and Antonesha went into cardio-respiratory arrest. She was not provided with proper resuscitation and she died, leaving behind 1 1/2-year-old Antonio and 6-month-old Antwane. Her parents, Maria and Anthony Ross, sued on behalf of the children, and accepted the settlement of annuities offered by the defendants. 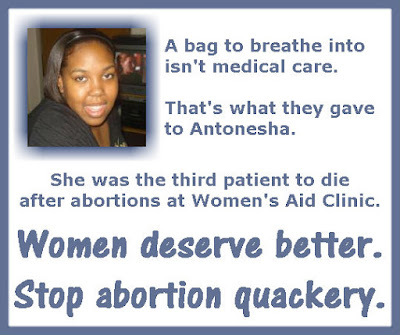 Antonesha was the third patient I know of to have died after abortions at Women's Aid Clinic. Kathleen Gilbert and Dorothy Musorewa had both been sent home to bleed to death. Claudia Caventou, age 33, underwent a safe, legal first-trimester abortion at Mercy Medical Clinic in Los Angeles on May 8, 1986, performed by H. N. Fahmy. Claudia's boyfriend was in the waiting room during the procedure. Staff told him that everything was okay, and suggested that he leave and get something to eat. Since he'd heard Claudia screaming earlier, he decided to stay. Several hours later, he heard the doctor come out and tell his staff to call 911. Claudia was taken to a hospital where she underwent emergency surgery for what doctors thought was a perforated uterus. It turned out that Claudia's pregnancy had been in her fallopian tube, which had ruptured during the abortion. Efforts to save Claudia were futile, and she died later that day. Twenty-four-year-old Maura Morales was eight weeks pregnant when she went to Woman's Care Center in Miami for a safe and legal abortion on May 8, 1981. When she was in the recovery room, her heart went into spontaneous ventricular fibrillation -- irregular heartbeats not capable of effectively pumping blood. Maura was taken to a hospital, but died that day. Maura was the fourth woman to die at the same facility. The others were Shirley Payne, Myrta Baptiste, and Ruth Montero. On May 8, 1928, 27-year-old Margaret Barnts died from a criminal abortion performed by Pauline Zickerman. The defendant was indicted for felony murder on May 15, 1928. Her profession is not mentioned. The most common profession of abortionists in the illegal era were physicians. Chicago was a particularly genial place for these practitioners in the late 19th and early 20th centuries due to police corruption. Even multiple dead patients were not enough to take a physician-abortionist permanently off the streets. We will see this in the cases we remember today. On May 6, 1924, 24-year-old Madelyn Anderson died at Chicago's Washington Park Hospital from a criminal abortion perpetrated that day. On May 13, Dr. Louise Achtenberg was arrested for Madelyn's death. Achtenberg was indicted for felony murder on May 15. Achtenberg already had a bad record as a criminal abortionist. In 1907, Dora Swan had died in a Chicago hospital after an abortion by Louise Achtenberg. "Louisa Achtenberg," identified as a midwife, had been implicated in the 1909 abortion death of Florence Wright. An abortionist identified only as Achtenberg was implicated in the 1921 abortion death of Violet McCormick. It would seem that the same woman, Louise Achtenberg, was responsible for all four deaths. She was identified as a midwife in 1909 -- a term commonly used to describe obstetricians, particularly if they were female. After returning home, Frances summoned Jerome from his job as a printer and told him she was “unwell.” She must have indicated that the illness must have something to do with her pregnancy, because Jerome later testified that he asked her, “Natural?” She told him no, which Jerome knew meant that she had undergone an abortion, as she had, by her own admission, “done many times” before. Frances rested afterward, and seemed to have recovered, but by the end of the month she was bleeding vaginally, “pretty hard,” as Jerome put it. He called her mother to come and care for his wife. Her condition continued to deteriorate, with Frances developing vomiting and chills. Jerome testified that Frances never gave him any details about the abortion – but nevertheless was able to summon Warner as the doctor who had performed the abortion. Warner came to the Collins home two or three times to look after his patient, with no improvement in her condition. Finally, at the end of April, somebody summoned Joseph T. Woof, the family doctor, who hospitalized her. He testified that he knew that she'd sought abortions in the past, against his advice. Frances died on May 6. During the autopsy, it was discovered that Frances actually had an ectopic pregnancy. Her "many" prior abortions made her high-risk for this dangerous condition, so in a way the previous abortions probably contributed to her death as much as the final one. Given the state of medicine at the time, it's unclear how likely France was to survive an ectopic pregnancy had she sought obstetric care rather than an abortion, but her efforts to have her already doomed baby killed certainly hastened her death. At 6:30 on the evening of May 2, 1907, 26-year-old Austrian immigrant Annie Horvatich asked her new husband, Michael, to accompany her to the home of Dr. Louise Hagenow. It was late by the time they arrived. Though she didn't bring a change of clothes or any type of overnight bag, she asked Mike to look after her children (She had three from a previous marriage.) and to come and see her on Saturday. Mike, who told his story through a translator, said that he didn't know Hagenow and didn't know what his wife's purpose was in the visit -- a claim that isn't held up by the letter he says he got from her the next day assuring him that there would be no "serious happenings" during her stay. Mike went to Hagenow's home on Saturday afternoon and found his wife sitting up in bed. She told him she was unwell and sent him home, saying she would not be returning home until Monday. On Sunday, Mike got a phone call to go to Hagenow's place. He arrived at 10 p.m. to find his wife very sick. A Dr. Rasmussen was also present. Mike remained at Annie's side during the night, noting that by morning she appeared to be much worse. He went to the home of Mary Galavitch, who could speak English and thus serve as a translator. When Mike and Mary arrived, Hagenow met them and told them that Annie had died at 5 a.m.
Hagenow gave Mike a business card for a neighborhood undertaker. Mike indicated that he'd prefer an undertaker that he knew. He sought out W.J. Freckleton, who went to Hagenow's home to pick up Annie's body at around 5 p.m. He said that Hagenow told him that he should return after dark to take Annie's body out the back way. He returned at about 9 p.m. with an assistant, and found it very difficult to get Annie's body down the narrow staircase. He said that Hagenow told him that her regular undertaker never reported any trouble getting bodies out down that staircase. The funeral was held, Annie buried, and it seemed as if Mike and the children would be getting on with their lives as best they could. That changed on May 13. The Cook County coroner, attended by Annie's brother, John Sneller, exhumed Annie's body. A post-mortem examination revealed that although Annie's death had been attributed to pneumonia, her lungs had been quite healthy and normal -- as were most of her internal organs. It was in her pelvis that the true cause of death was found. Her uterus was lacerated, with the top of the uterus torn nearly off, causing fatal peritonitis. From the condition of her uterus, the doctors gauged that she had been about four months pregnant, but there was no sign of the fetus, which evidently had been successfully killed, removed, and disposed of. Hagenow admitted that Annie had come to her place on the 2nd and died on the 6th, but insisted that Annie had been bleeding vaginally upon her arrival. She insisted that Annie told her she had seen a doctor on the South Side who had "brought her around" (i.e. done an abortion). Hagenow's claim that she hadn't performed an abortion on Annie wasn't very credible, given her history. She advertised consistently in Chicago daily papers, ads reading, "Dr. Louise Hagenow; licensed physician; expert; twenty seven years; female diseases; a new scientific, painless method; no operation; good results...." " In short, she was an open and known abortionist. Also entered into evidence in the trial was the dying declaration of Marie Hecht, who died from one of Hagenow's "scientific, painless" abortions in 1899, as testified to by the police officer who had taken the statement. Likewise entered into evidence was the testimony of a doctor who Hagenow had brought in to help try to save the life of a young woman Hagenow had disemboweled in the process of an abortion sometime ten or fifteen years prior to the trial over Annie's death -- which would mean this woman could have been Minnie Deering (1891), Sophia Kuhn or Emily Anderson (1892), Hannah Carlson (1896), or another as of yet unidentified woman. A police officer also testified about taking the dying declaration of Lola Madison. To top it off, during cross-examination, Hagenow admitted involvement in the abortion death of Hannah Carlson. The appeals court noted, "had the evidence shown that Annie Horavitch was the only pregnant woman whom [Hagenow] had caused to miscarry or abort, it might not have been unreasonable to presume that she did so in good faith and for the purpose of saving the woman's life. .... [but for] 27 years [Hagenow] had been constantly engaged in producing miscarriages and causing abortions... [and] she kept a place for the treatment and care of women upon whom miscarriages and abortions had been caused and performed; ... she was surrounded at her house by men and women engaged in the business of causing and producing criminal miscarriages and abortions, and ... she had caused the death of several women upon whom she had caused miscarriages and produced abortions within a few years prior to her indictment for causing the death of Annie Horvatich ...."
Hagenow, nearly 60 years old at the time of her trial, was sentenced to 20 years in prison for Annie's death. Hagenow, who had already been implicated of the abortion deaths of Louise Derchow, Annie Dorris, Abbia Richards, and Emma Dep in San Francisco, would be released from prison to be implicated in the abortion deaths of Lottie Lowy, Nina H. Pierce, Jean Cohen, Bridget Masterson, Elizabeth Welter, and Mary Moorehead.